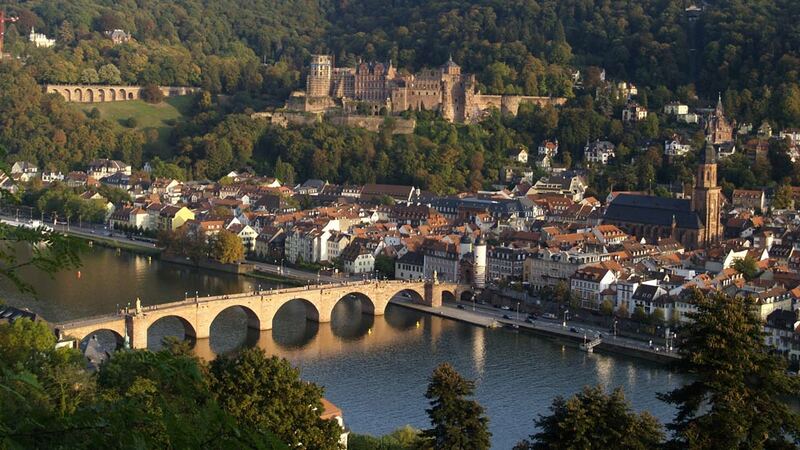 The Hahn Express is a cheap airport shuttle bus service from Flughafen Frankfurt Hahn Airport (HHN) to Heidelberg, Mannheim, Ludwigshafen, and Alzey. Advance ticket reservations through Flixbus give the cheapest deals and reserved seats. Flughafen Frankfurt Hahn Airport (HHN) is rather inconveniently located in western Germany far from Frankfurt am Main. Buses usually provide the best public transportation to Hahn Airport popular with low-cost airlines such as Ryanair. The Hahn Express bus service is the most convenient and cheapest way to travel from Frankfurt-Hahn Airport to Alzey, Ludwigshafen, Mannheim, and Heidelberg – advance reservations through Flixbus are recommended for best prices. (Flibco no longer operates on this routing.) If bus connections from Heidelberg to Karlsruhe are not convenient, change to the train in Mainz or Heidelberg. Private airport shuttle services are fairly rare in Germany but are available if reserved in advance. For small groups a shuttle service from Hahn Airport may be worth the splurge but compare service providers before booking. Taxi2Airport and Suntransfers give online quotations for private airport transfers without first requiring personal details or flight numbers. The Hahn Express shuttle buses provide the cheapest and most convenient way to travel using public transportation from Frankfurt-Hahn Airport (HHN) to Alzey, Ludwigshafen, Mannheim, and Heidelberg. Alternative options to these cities are to use the Flibco / Bohr Omnibus service to either Frankfurt am Main or Mainz and continue from here by train. The Hahn Express (bus 140) run by Holger Tours operates up to seven times per day – the timetable changes according to the season and although designed according to flights, the actual bus runs as per the timetable and does not wait if flights are delayed. Usually only two of the buses go all the way to Karlsruhe and Baden Airpark – changing to a train in Mainz is often the easier option. The first bus of the day usually arrives at Hahn Airport in time for flights departing after 6 am. The last Hahn Express bus from Frankfurt-Hahn Airport leaves around midnight (although this one may wait up to 10 minutes if flights are slightly late). The timetables are adjusted frequently with fight schedule changes. Tickets for the Hahn Express is best bought online in advance through Flixbus. (Flibco no longer operates on this routing.) Ticket prices varies with demand with Flixbus frequently having special deals and offers. Full-fare online ticket prices for the Hahn Express to Frankfurt Hahn Airport (HHN) are €22 from Alzey, €25 from Ludwigshafen, Mannheim, and Heidelberg, €33 from Karlsruhe, and €40 from Baden Airport. It is only possible to buy tickets from the driver if seats are still available – no standing on intercity buses. Tickets bought from the driver, or any other agency, are always more expensive than purchasing directly online. Only cash is accepted on the bus. Hahn Express buses can be painted in a variety of colors or bus company names. Ask if unclear as other buses also use the same stops. Flughafen Frankfurt Hahn Airport – Bus Stop 16 at Terminal A.
Alzey – Bus Stop “Arbeitsamt”, which is in Schafhäuserstraße in the direction of the Autobahn A61 next to the car tire shop Reifen Schwab (and not at the Agentur für Arbeit). Ludwigshafen – Hauptbahnhof (Main Train Station), Bus Stop 6. For airport shuttle bus services to other cities see Transportation to Frankfurt-Hahn Airport for more information.